"I felt like an enormous burden had been placed off me, but at the same time I knew that they were OK. I always felt they made it," he said. The Kubickis and eight others from Mission Viejo Christian Church in California arrived in Port-Au-Prince a week ago to help assist nearly 100 abused and abandoned children at the Maison De Lumiere Orphanage. The California missionary workers have been volunteering at the orphanage for nearly six years, since church members Bill Manassero, his wife Suzette, and Jim Duggan opened the center. But by Friday there was chaos at the orphanage in Haiti out of concern that severe shortages of food, water and medicine was sparking anger in the people they had been trying to help. "People are becoming hostile at the missionary workers and we now find ourselves desperately trying to get them out," said Mike Maiolo, senior pastor of the volunteers' home church in Mission Viejo, California. He said he had received urgent messages from Haiti that everyone wanted to leave. By Saturday morning, concern turned to joy, when nine of the workers were airlifted to safety, according to Maiolo. 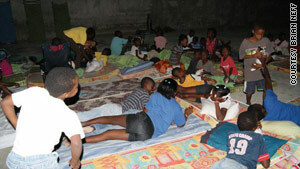 Two workers stayed behind to help the orphaned children at Maison De Lumiere. Maiolo told CNN the nine workers were driven to the Haiti airport by a private contractor overnight and flown to Santo Domingo, Dominican Republic, where they planned to board a commercial flight to Miami later in the day. David Neff's teenage son, Brian, was among the nine workers who made it out safely. "When they arrived in Santo Domingo, they were all extremely fatigued but grateful to be alive," the father said. "Lots of doctors and nurses have been coming by the facility because word's gotten out, so there's all these people being pulled out of rubble and they're assisting and attending to the injured as best as they can," Marty Kubicki said Thursday. He said the situation had deteriorated to the extent that no one felt safe going outside the compound. Contact with his missionary members in Haiti has been limited to occasional text messages, Internet streaming and e-mail, he said, and his volunteers were having trouble reaching U.S. State Department officials. By Saturday afternoon, Maiolo's communication with the group had paid off. One of his church members was able to hire a private contractor and coordinate a logistical plan to get them out safely. He said the orphanage appears secure now and the two members who stayed behind are no longer in harm's way.